10K Yellow Gold Art Nouveau Necklace 24"
Please refer to our stock # vj201055 when inquiring. 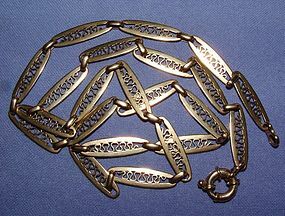 10K yellow gold chain made of 22 handcarved links with beautiful art nouveau motif,(7 x 24mm), approx 24" long. Modern spring ring. 23.8 g LAYAWAY AVAILABLE!